Heat oven to 350°F. In large bowl, mix coconut oil, granulated sugar and brown sugar until well mixed. Stir in almond milk, vanilla and orange zest. Stir in oats, flour, baking soda, baking powder and salt until dough forms. Stir in pecans and cranberries. Drop dough by slightly rounded tablespoonfuls 2 inches apart onto ungreased cookie sheets. Coconut oil comes in two varieties: virgin and refined. Virgin coconut oil is made using a cold press process and retains more coconut flavor. Refined oil is more processed and is odorless and flavor-free. Melt your coconut oil after you measure it. 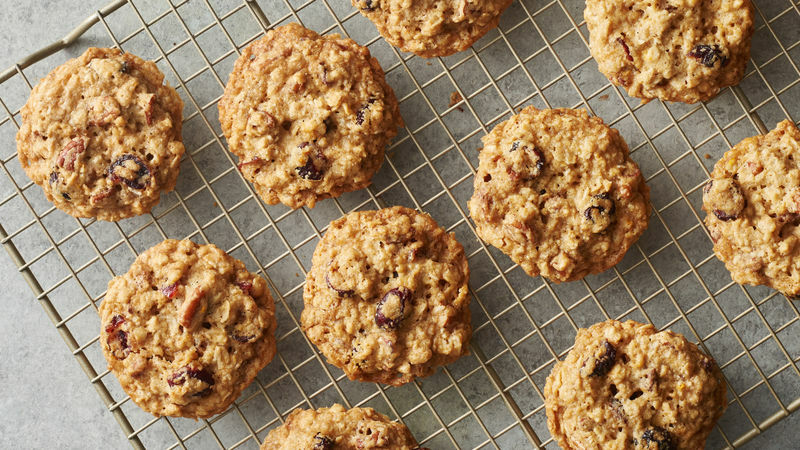 Walnuts can be substituted for the pecans in this cookie recipe. Quick-cooking oats can be substituted for the old-fashioned oats that this recipe calls for.